Just as living things must continually consume food to replenish their energy supplies, cells must continually produce more energy to replenish that used by the many energy-requiring chemical reactions that constantly take place. Together, all of the chemical reactions that take place inside cells, including those that consume or generate energy, are referred to as the cell’s metabolism. A living cell cannot store significant amounts of free energy. Free energy is energy that is not stored in molecules. Excess free energy would result in an increase of heat in the cell, which would denature enzymes and other proteins, and destroy the cell. Instead, a cell must be able to store energy safely and release it for use only as needed. Living cells accomplish this using ATP, which can be used to fill any energy need of the cell. How? It functions as a rechargeable battery. When ATP is broken down, energy is released. This energy is used by the cell to do work, usually by the binding of the released phosphate to another molecule, thus activating it. For example, in the mechanical work of muscle contraction, ATP supplies energy to move the contractile muscle proteins. ATP is a complex-looking molecule, but for our purposes you can think of it as a rechargeable battery. ATP, the fully charged form of our battery, is made up of three phosphates (the “TP” part of ATP) attached to a sugar and an adenine (the “A” part of ATP) (Figure 1). 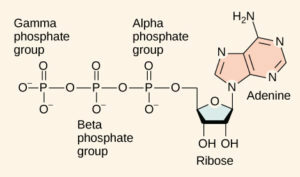 When the last phosphate is broken off of the ATP, energy is released. The result is a single phosphate and a molecule called ADP (“D” stands for “di” which means two). Figure 1 The structure of ATP shows the basic components of a two-ring adenine, five-carbon ribose sugar, and three phosphate groups. A high amount of energy is required in order to recharge a molecule of ADP into ATP. This energy is stored in the bond between the second and third phosphates. When this bond is broken, the energy is released in a way that the cell can use it.